Two brothers, two trucks and a plan. Over 80 years ago John and Elmer Heeren had an idea to supply fresh produce to Michigan long after the state’s growing season had ended. So, the budding entrepreneurs came up with a simple but resourceful plan. In 1933, John drove from Grand Rapids to the Southern Growing States purchasing all the fresh produce he could carry. Behind the wheel of a truck filled with strawberries and other fruits and vegetables John headed back North. Elmer, in turn drove an empty truck South to meet his brother halfway and the exchange was made. Elmer's empty truck for John’s truck filled with fresh produce. Elmer took the truck loaded with produce and completed the journey back to Grand Rapids. John took the empty truck and headed back South for more fresh produce. The process was repeated and the business began to expand. The brothers then began working with local Michigan Apple Farmers to distribute their apples. These relationships provided the catalyst to build a facility to store, pack and sell apples in the fruit growing heart of Michigan. From distributing fresh produce cross country to servicing Michigan Apple Growers, John and Elmer had laid the seeds for a lasting organization. Following in their father footsteps, sons Bob and Sonny split the duties of hauling and selling produce at markets and eventually to their own facilities. By the 1980’s, Heeren was distributing a full line of fruits and vegetables. Hereen connected local farmers with Midwestern retailers and partnered with apple growers throughout the state of Michigan. By the time Bob and Sonny Heeren were ready to retire in the late 1990s, the business had grown from 2 employees to more than 80. The 2000’s saw a third generation of Heeren Brothers hitting their stride. Growth in the business continued as Heeren merged with J.A. Besteman. This merger allowed distribution throughout Michigan, Northern Indiana and Ohio. Expanding into farming operations of their own, they invested in a 300 acre apple orchard. In 2013, Heeren completed construction of a 180,000 square foot facility bringing the distribution and apple business together under one roof. 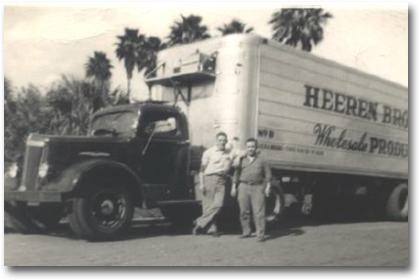 Today, the Heeren legacy continues to grow as third and fourth generation family members, along with more than 150 employees, are all helping lead the business into the future.